Click HERE to plan your own route on a larger map! It might be a bit of a hot and bumpy ride, but rest assured, your hot tub will be ready for you when you arrive! 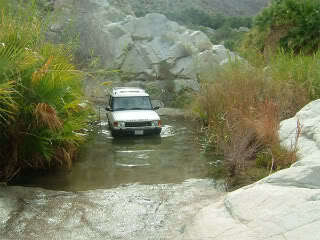 Guadalupe Canyon Oasis is located southwest of the city of Mexicali in Northern Baja California, Mexico. We are located just 50 miles southwest of Mexicali and 135 miles southeast of Tijuana, off Highway 2. From the states, the most popular routes are through the border towns of Tecate and Mexicali. To the left, you will find an interactive Google Maps tool on which Guadalupe Canyon Oasis is pinpointed. Our most popular routes are highlighted on this map and also described below. You can also click below the map to find your own location and plan your route accordingly! 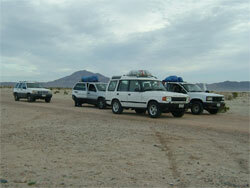 We suggest that you purchase Baja car insurance before you come. Guadalupe Canyon is off the beaten track, so the extra peace of mind will be well worth it. Bajabound.com has plans available specifically for Baja driving that are very affordable and can be purchased by the day. This will ensure that your vehicle stays safe while it's across the border. We know the faces behind the company name, and they're good people who will take care of you. 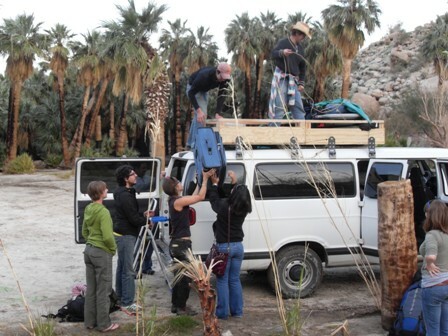 Don't hesitate to call upon our Shuttle service if the directions sound too adventurous. This route is the easiest for those who are unfamilar with driving in Mexico and want to take the simplest, most direct route to Guadalupe Canyon Oasis. We also recommend this route for those traveling from or through Los Angeles since traffic is usually milder than on the I-405/I-5 to San Diego. In addition, this route is free of toll-booth charges, unlike the Tecate route. Take I-5, I-405, 91 East, 60 East, or 210 East as needed to reach I-10 East. Merge onto the I-10 East towards Indio. Continue just past the city of Indio, and exit onto Hwy 86 South towards El Centro. After 70 miles, turn right to continue on Hwy 86/South 1st St. Continue to follow Hwy 86. After 4 miles, exit onto Hwy 111 South towards Calexico/Mexicali. Be sure to take a break to make sure you have all necessary gas, water, ice, and food supplies in Calexico before crossing the border since services are harder to find after this. Cross the Calexico/Mexical border. This border crossing is usually very quick in this direction, but can sometimes be busy. The crossing is open 24 hours a day. Once you cross the border at Mexicali, head south on Calle Guadalajara (through a section of downtown Mexicali) for about 5 miles, following signs to Mexico Highway 2. Merge onto Highway 2 West (towards Tecate/Tijuana). After about 15 miles, you will begin to cross the surface of the Dry Lake Bed. The first junction for "CAÑÓN DE GUADALUPE" that you will encounter is the Dry Lake Route. Continue on 2.7 miles if you wish to take the Graded Dirt Route. See below to decide which route to take. From I-5 Southbound, take exit 15B for Hwy 94/ MLK Jr. Freeway. Merge onto Hwy 94 East. Turn right on Hwy 188/Tecate Rd. This should take you right to the border crossing. You will emerge from the border crossing onto Calle Presidente Lazaro Cardenas, heading south. Two blocks south of the border, turn left onto Calle Benito Juarez past the beautiful plaza of Tecate. Make an immediate right onto Calle Presidente Pascal Ortiz Rubio, and continue south on this highway. After about 1.5 miles and at the top of the hill, you will encounter the "cuota," or toll road, Highway 2, which runs East (Mexicali)/West (Tijuana). Take the toll highway East towards Mexicali. After approximately 30 miles, you will pass through a small town called La Rumorosa (your very last chance for supplies!) and begin to descend through a scenic rock garden for several miles. The road is steep and the views are beautiful. The current toll rate is 20 pesos paid at the toll booth. You will emerge from the rock garden onto a very large flat expanse. This is the beginning of the Dry Lake Bed. After about six miles you will come to a safety check point, in most instances you will waved on. In about four miles will notice the turn off sign junction for "CAÑÓN DE GUADALUPE". This is the Graded Dirt Route that is recommended for first time visitors. Continue on 2.7 miles if you wish to take the Dry Lake Route. See below to decide which route to take! There are two roads leading to Guadalupe Canyon Oasis from Highway 2. They eventually merge back together. THE GRADED DIRT ROAD IS THE RECOMMENDED ROUTE FOR THOSE COMING FOR THE FIRST TIME. Please read the route descriptions carefully in order to choose the best option for your trip. Please contact us for more information and current road conditions! Follow Highway 2 West for 20 miles to the first "CAÑÓN DE GUADALUPE" junction. This is the entrance to the eastern dirt road that leads south to Guadalupe Canyon Oasis. This junction can only be entered from the east lane, so once you pass the overhead sign, you will need to circle-back using the first available U-turn lane. Follow Highway 2 West to the first "CAÑÓN DE GUADALUPE" junction. Pass this junction sign This is the entrance to the western dirt road that leads to Guadalupe Canyon Oasis and is recommended for first time visitors. This route is the more "official" road to Guadalupe Canyon Oasis, and is slightly higher in elevation, but suffers from some patches of bumpy washboard and sand, and therefore is a little slower than the Dry Lake Route. Nevertheless, this road is generally the safer, surer route if the eastern route is likely to be muddy. If in doubt please call our travel office. Once the two routes merge back together, the last segment of 7 miles begins as a mostly smooth but increasingly winding dirt road. Following this, there is a final half-mile or so of rocky road. SUVs and trucks with good ground clearance are recommended and tend to do best. However, with a bit of cautious driving, two wheel-drive vehicles with good ground clearance should be able to make it without trouble. 4. Go straight and continue on this road. See the green sign with the "Guadalupe Canyon Oasis" and website name on it and the arrow that points straight ahead to the hot springs. Once at the hot springs here is a small creek that crosses the road, and is less than 6 inches deep. This is an easy crossing. Be sure to and bear left (straight) at the fork, following signs to "Guadalupe Canyon Oasis". This is a large green sign. The Guadalupe Canyon Oasis main office is located here where Ernesto Loya and his family will welcome you and check you in.